Starline Garden Fountain has a naturally compact, columnar shape that makes a wonderful upright cordon apple tree. Despite its compact size, Garden Fountain produces an abundance of fruits that can be picked in September and October. The apples have bright green-yellow skin and the flesh has a mild, balanced flavour. Growing to around 2 metres in height, Starline Garden Fountain is perfect for growing in a patio pot, planting in a small border or in a row. These excellent self fertile cordon apple trees are easy to care for and benefit from having resistance to mildew and scab. 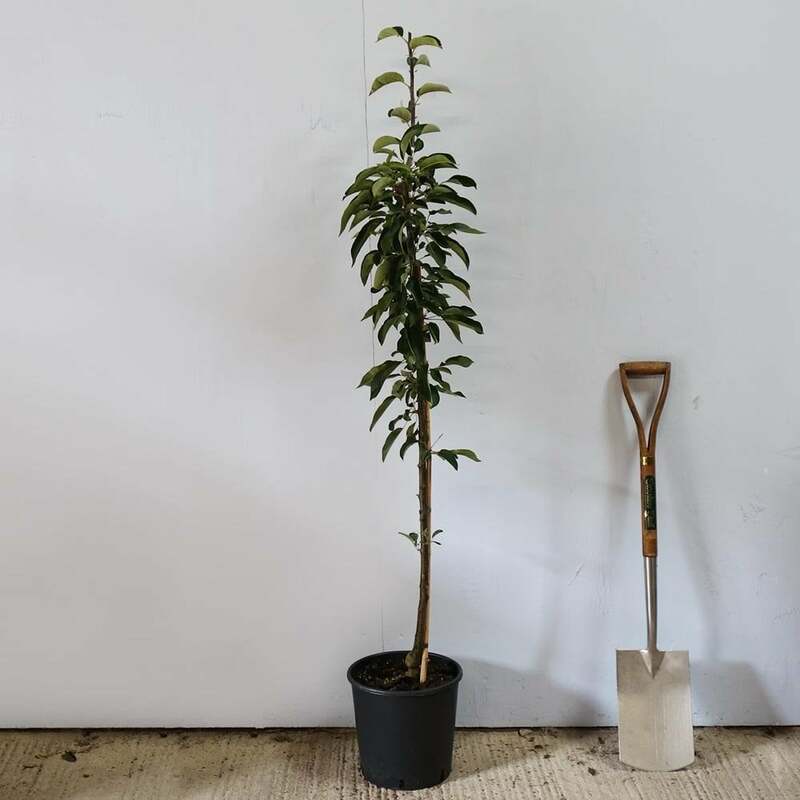 Garden Fountain upright apple trees don't require a pollinator, so only one tree is required, but if do wish to plant several then they can be planted just 60cm apart. Our pot grown cordon apple trees can be planted at any time of the year, whereas bare root ones can only be planted between November and March. Remove weeds and grass within a metre of your desired planting hole, then dig a square hole slightly deeper than your root mass and 2-3x as wide. To help your tree establish, apply root grow. Gently loosen the roots and place into the planting hole. Using 50% of the original soil and 50% compost, fill in the hole and firm around gently, making sure not to bank the soil up around the collar of the tree. Add a stake and tie to anchor the tree. If you’re planting Garden Fountain in spring or summer, water well and regularly for the first few months. If you’re planting in autumn, you may only need to water a little. Keep an eye on young fruit trees and increase watering if there are periods of hot or dry weather. Keep the area free of competing weeds and grass for the first few growing seasons. The guide linked to above provides further advice. Our Garden Fountain cordon apple trees will already have a central leader. Simply prune to maintain the shape of the tree if required and remove any diseased or damaged branches. Carry this out between November and March.